Australian pop punk band 5 Seconds of Summer are shaping up to have a busy 2016 as they have extended their Sounds Live Feels Live tour date schedule with recently announced North American concerts for July, August, and September. The band's world tour will follow a run of Jingle Ball concerts in the United States during December of 2015. In 2016, they'll be touring Asia in February and March before hitting England in April. 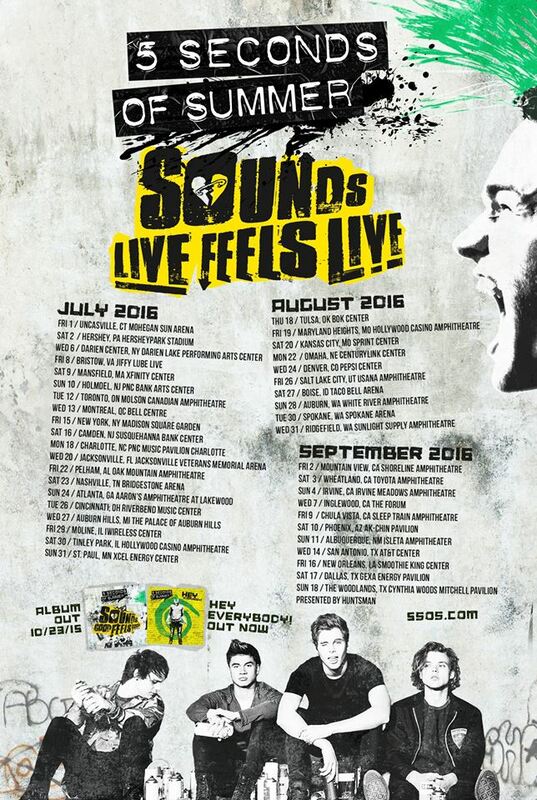 Check below for 5 Seconds of Summer's full 2015-2016 schedule and information about presale codes and tickets. When do 5 Seconds of Summer 2016 North America tickets go on sale and what's the presale code? People who preorder Sounds Good Feels Good via Amazon, iTunes, Target, or Google are eligible for presale tickets by filling out this form. The album is scheduled to be released on October 23, 2015. Soundcheck Experience VIP passes and Citi cardmember preorders begin as early as October 20. Live Nation, LN Mobile App, and Ticketmaster presales begin as early as October 22. The general public on-sale begins October 23, 2015. Each date can be different, so check the links above for more information about the specific concert you're interested in. The Live Nation presale offer code is PIANO and the Live Nation mobile app password is COVERT. For the latest music, news, and tour dates from 5 Seconds to Summer, check out their Zumic artist page.